Using the name or id is okay for simple tests, but for more complex situations, you need to know how to write XPath queries. Even though you will typically start off by using the Selenium IDE Firefox plugin to record a test, which will automatically generate selectors for you, in practice you will usually find that you need to change some of them. This will often happen when you are dealing with a web page that is dynamically generated. For example, suppose you are searching a website for a shirt to buy. If there are various sizes and colours available for the shirt, you could get back multiple “Add to bag” buttons. When you click the button for the white shirt in collar size regular, the Selenium IDE won’t know that this is what you are doing. It will do its best to write an expression that picks out the button, but it will probably be incorrect. For example, if the button you click is the second one on the page, the Selenium IDE could use that to pick out the button. However, if you rerun the test and some of the sizes or colours are out of stock, the button you want might not be the second one. What you really want to do is write a test that knows to “click the button for the white shirt in regular size”. XPath allows you to do this, but XPath queries can be quite complex to begin with, so the purpose of this tutorial is to guide you through writing a query, step by step. Did you spot it? 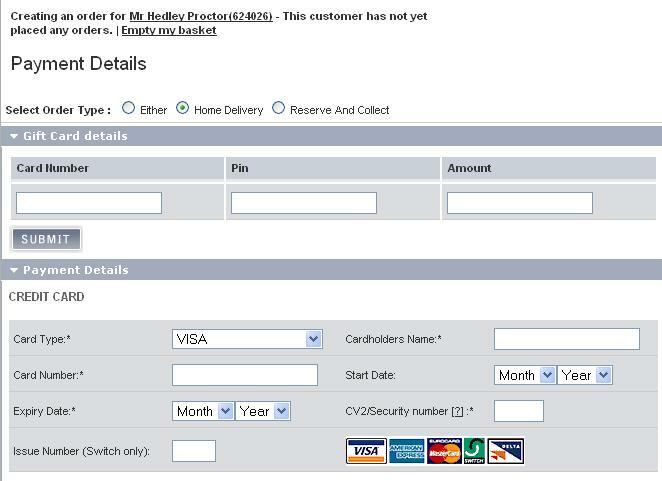 There are two “card number” fields on the page. The recorded Selenium test was picking up the one for the gift card. You can see that we need the one in the credit card section, so how do we go about changing the selector to pick this out? Using the Selenium IDE itself – it has a “test” option. 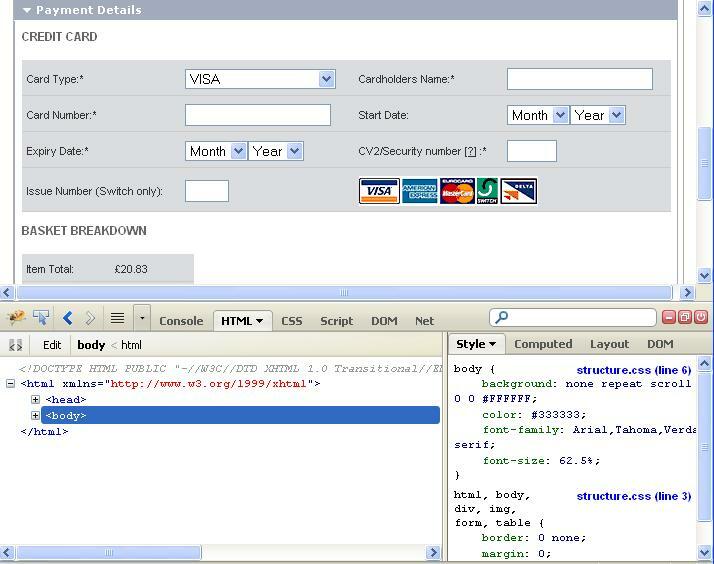 Using Firebug and a separate XPath tester. Using Firebug and the FirePath tester, which is a separate add-on but integrates with Firebug. This entry was posted in Selenium, Testing and tagged selenium, Testing. Bookmark the permalink. Hi, very nice and helpful! But I have a question: You wrote Selenium can only select by id, name or xpath. What about css selectors, tagname, linkname or class? Another question: why is using IDs only for simple tests ok? you suggest to use xpath in complex tests. why? IDs are unique so I can’t see any problems with that. Sorry, my list wasn’t exhaustive – you can use css selectors and links. 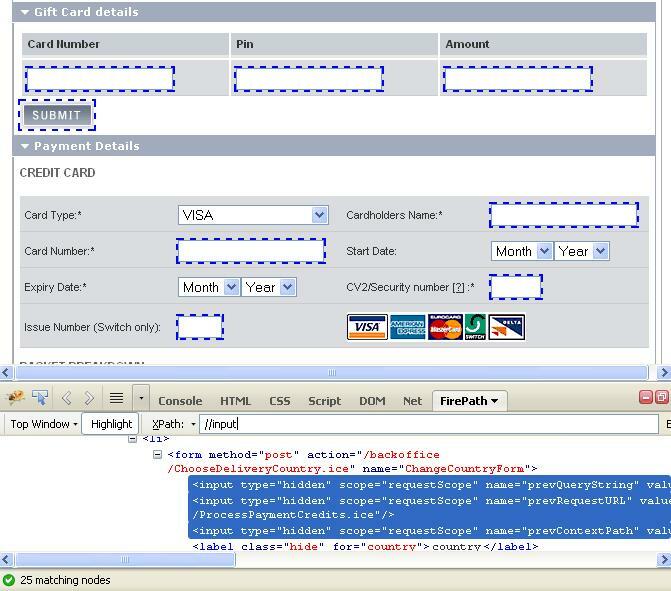 With regards to ids, if all of the elements on the page have sensible ids, that is usually the best option. However, sometimes this isn’t the case. Firstly, some applications won’t have ids for all elements. Secondly, if elements of a page are dynamically generated, then the ids will be too, and you can end up writing a test that relies on understanding hidden application logic for generating ids, rather than relying on the information visible to the user. Consider the example I give of searching for a shirt in a particular colour and getting back a list of all of the colour variants of that shirt. If the application generates ids for the elements representing these colour variants, what format will they take? If they are labelled “shirt-blue”, “shirt-green”, “shirt-yellow” then you might be okay – your test knows it is looking for the yellow shirt and it can pick it out using the ids. However, if they were labelled “shirt-1″, “shirt-2″, “shirt-3″ then you can’t use the id to locate the element. However, you know that that part of the web page must be visibly labelled “yellow” for the customer to see. By writing an XPath expression you can make use of this visible label to locate the correct element. Excellent!! fire path makes my life easy now!! Thanks so much mate, for such nice article. Hi, the direction to use Firepath was excellent and helped me learn and practice xpath directly on a web page. thanks, a very good example. Perfect explanation. It resolved my doubt. Thanks!!! I have a problem with xpath. I have a local variable “end” which is essentially a date, I am creating an element with value( “testauto” + end). I tried to go through the W3 schools xpath tutorial but could not find a way to do this. Will aprreciate if you can help. Somehow the xmla I pasted is removed from the post, can you see it? Thanks hedleyproctor for paving my way in learning Selenium. So just assume it has td tag…as it’s not letting me paste with td tag. Hi Deep. If you want to get the text content of a node you can use the text() xpath function. Off the top of my head I would guess something like //td[text()=\"testautocomms27 Sep 2012\"] should pick out that td. by using this xpath, i am capturing the error message displayed on my application like “Please check your Password”. Now how can I write it in Webdriver. I have different ways but, not worked out. “String msg= driver.findElement(By.xpath(“//*[@td=\'error2\']“)).toString();” – This is what i did in Webdriver. I’m a little confused – if the XPath expression works in Selenium RC the same expression should work in the WebDriver. Are you really trying to write the same expression or is the second expression testing a different page of your application? Since I have tried translate function but that haven’t work for me. Would you recommend a Selenium IDE with xPath instructor-led training class in the Mid-Atlantic area? Sorry, I’m not really familiar with Selenium training courses. The documentation is pretty good so I’d recommend working through that. Don’t know how do I thank you. Great elaboration and you are a great teacher too. But it would have been more better if you would have used a dynamic id for the element which changes with every page load . In that case how to manage the id attribute. A really beautiful tutorial! !thanks a lot! !as a beginner it was really very helpful.. I am curious, why can’t you use the xpath that FirePath generates for you? I was using just Firebug and so far when I select an element, which is then highlighted below, I then rightclick below and use Copy XPath. From that, I’ve so far not had any problem finding exact elements when testing (or automating). It seems FirePath generates an even more exact xpath than the Firebug did. Why do you need to modify what it already provides for you? Sometimes this will work, but the problem is that the XPath that FirePath generates doesn’t necessarily match what you are conceptually trying to achieve, which can make the XPath brittle if the page changes. Imagine a payment page that has a credit card payment area at the top, and a gift card payment area at the bottom that has similar html elements. If you try to pick out the credit card number field with FirePath, it might decide that the best way to pick out the credit card field is to specify that it is the first of the two similar fields. What happens if the application developers change the design of the page to put the credit card at the bottom and the gift card at the top? The XPath will break. 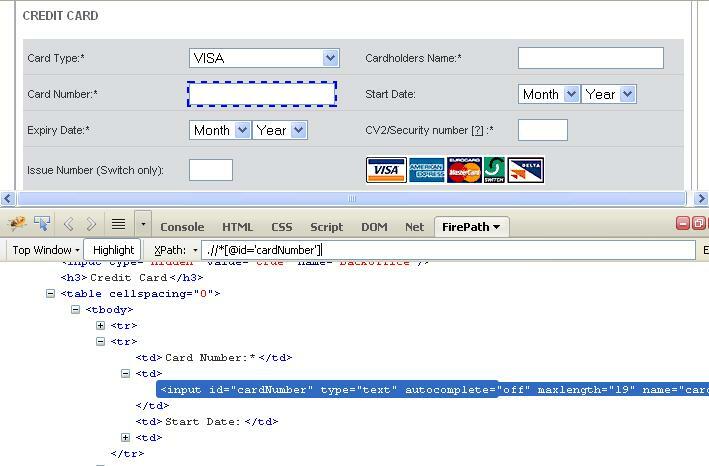 By contrast, if you have an xpath expression that says something like “pick out the input element that is inside a div which also contains the text ‘credit card”, even if that section of html is moved around on the page, the xpath will still match. Similar reasoning applies if you are testing an application that can be configured in different ways for different customers. A second consideration is trying to make your xpath expressions as readable as possible for other developers or testers who might need to maintain the tests. An expression like /h3/div/input doesn’t really tell someone what it is trying to pick out, whereas something that says /div[@title=\'Credit Card\'] makes the intent of the xpath much clearer. Of course, I can’t emphasis enough that really all applications should use distinct ids on their html elements wherever possible, so that no xpath is necessary, and you should encourage the application developers to add them if they are missing! Everything else is static, but I can’t get to the items that are on “page-1″ of the result set. has a size() of 25, but there are a further 7 rows that seem to be on a separate ID. I’ve found if I set a breakpoint in the IDE at the point I make this call to list elements, and scroll down to the bottom of the table, and then click the next step, it does return 33 as a size, but not sure how I can scroll down a table at runtime in selenium. Any help on this greatly appreciated. Congratulations , turotial great . Why not just use the “id” attribute… is it because “id” values are not enforced to be unique? Yes, you should use the id wherever you can. However, if you are dealing with dynamically generated page elements, you need to be happy that you understand how the ids will be generated. As long as you can talk to the developers of the app and make sure you understand how the ids are generated, you should be able to specify them correctly. I think this is the second time I’ve referred to this tutorial to brush up on xPath. Good job Hedley. Hope you and yours are all blooming. Thanks George! Hope you and the family are well! Hi Hedley this is a great guide but I am new to selenium and I am having problems implementing this on a page I am testing. can you help and see what I am doing wrong. Really good explanation of Xpath manual writing, it’s give up to me a more confident to write the xpath. Thanks – very good instructions to get someone going with xpath in Selenium. I could paste xpaths right from the selector in Firepath into my findElement clause in Selenium java – nice! very useful and helpful explanation.Thanks a lot. You could use the $x(“”) in chrome console (F12 > Console tab). These are specially helpful when checking tables.